Centella Asiatica — It’s a Superstar. Tiger grass, though, isn’t a grass at all — it’s a perennial herb, and its name is centella asiatica, though it’s also known as centella, cica, or gotu kola. You may have noticed it in so many of your Korean skincare products, and there are a few very good reasons for that. Centella asiatica really does have incredible healing properties. The tiger anecdote is a cute story, but there’s actually science behind why tigers would roll around in centella asiatica. Scientists have studied centella asiatica and its purported healing qualities, testing the efficacy of topically-applied centella asiatica ointments on wounds. They found that wounds do indeed heal faster with the ointment than without, and this is due to two of the four main components found in centella asiatica — madecassoside and asiaticoside. Without getting too science-y, madecassoside has healing and soothing properties. A powerful antioxidant, it helps boost antioxidant activity around wounds, which, in turn, helps reduce inflammation, decreasing the overall time it takes for wounds to heal. Madecassoside also helps stimulate the synthesis of new skin cells, which you can imagine is essential to wound-healing. Asiaticoside helps boost the healing of wounds by encouraging the skin cells essentially to move to the wounded area and by stimulating the production of collagen. It also helps strengthen the new skin cells (that were helped along by madecassoside), decreasing the time it takes wounds to heal. Not only that, but centella asiatica also has strong antibacterial properties, which helps prevent infection and facilitate a faster, smoother healing process. It also helps fight visible signs of aging. Centella asiatica has also been studied for its anti-aging properties, which are, also, thanks to madecassoside. In a double-blind clinical study, 20 female participants between the ages of 45 and 60 topically applied a formula with 0.1% madecassoside with 5% vitamin C. After 6 months, their skin was visibly firmer and more hydrated, which was then biometrologically measured — and it all came down to collagen. Madecassoside boosts the production of collagen in skin. Collagen occurs naturally in skin and is the component that makes skin elastic and bouncy, giving us our youthful appearance. However, the amount of collagen in skin decreases as we age — women lose collagen at a steady rate of roughly 1% after age 30, but then collagen loss increases drastically in the first 5 years after menopause. Men, on the other hand, lose collagen at a steady rate of approximately 1% after age 30 throughout their lives. By boosting the production of collagen, madecassoside helps fight visible signs of aging. It can help reduce the appearance of fine lines and wrinkles, plumping them up, and the really awesome thing? Youdon’t need a lot of madecassoside to see these benefits! Remember, the participants in this study only used 0.1% madecassoside. 0.1%. When it comes to madecassoside, a little bit goes a really long way. Centella asiatica isn’t a modern fad but has been time-tested with roots in traditional medicine. Centella asiatica’s use in medicine dates back to the 17th century where it was used throughout South and Southeast Asia to treat eczema, psoriasis, and, even, the cold, amongst other ailments. Part of the reason for its continued use through centuries is its powerful efficacy. It’s also stood the test of time as a beneficial ingredient that addresses a wide variety of concerns. We may have highlighted madecassoside and asiaticoside in this specific post, but those aren’t the only beneficial compounds found in this herb. Centella asiatica is also rich in vitamin C, vitamin A, niacin, and beta-carotene, which help brighten skin, fight visible signs of aging, and boost circulation. It also has powerful skin-soothing properties that make it particularly appropriate for acne-prone, inflamed, or irritated skin, calming skin and helping to reduce redness. Of course, centella asiatica is not the end-all-be-all of ingredients; it’s one of the many beneficial ingredients out there for skin. Now that we’ve laid out some of the benefits of centella asiatica extract, here are a few products we recommend! 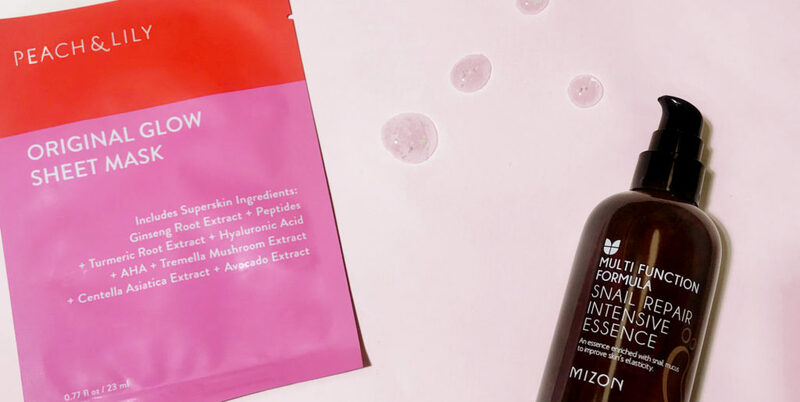 A waterless essence, Mizon’s Snail Repair Intensive Essence is 86% snail extract, which is itself also a very soothing, hydrating ingredient. Snail extract is boosted by centella asiatica extract, making this essence a truly wonderful product for irritated, sensitized skin. With a slightly gel-like texture, the essence cools skin as it absorbs quickly and helps reduce redness and inflammation, helping your skin get to a more balanced, healthy condition. Ground Plan’s Secret Soft Peeling Gel so gently exfoliates skin, you wouldn’t believe it was exfoliating. As you massage the gommage gel over your skin, the gel breaks off into little bits, adhering to impurities and oils on your skin and drawing them out. Centella asiatica extract means this exfoliator doesn’t aggravate skin or pull at it, but, rather, calms and soothes skin while removing buildup from your pores. All skin can benefit from our Original Glow Sheet Mask, which we formulated on your feedback and sheet mask wants! Use it when your skin is feeling tired and in need of a lift or when your skin is feeling irritated and on the verge of a breakout — we specifically included centella asiatica extract to soothe and calm, while all the other ingredients (like peptides, AHA, niacinamide, and more) work to help hydrate, brighten, and energize your skin.